Sani-Plugs provide a superior seal to tubing through a single-barb construction. Tubing clamps secure to the fittings behind the barbed area, which limits the risk of tubing being cut from a sharp, barbed edge and provides for attachment to a smooth surface. 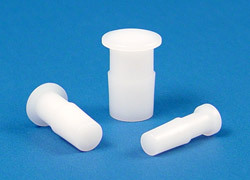 Sani-Tech West provides a full line of Sani-Plug Monobarb Sanitary Tubing Plugs of all sizes in polypropylene as well as a broad line of flexible tubing formulations that are ideally suited for use in conjunction with these sanitary tubing plugs. Contact us today for your specified sanitary applications.